London is said to be the glittering jewel of society, a world unto itself—but to Julia Elliston it is a city of shadows. Her life is swiftly dissolving into scandal. And in Victorian society, even a whisper of scandal—substantiated or not—can be the death of a young woman’s reputation. Now under the watchful eye of Lord Roy Pierson, one of most influential men in England, Julia begrudgingly accepts his protection. But Chance Macy’s power is far-reaching as well, and he is eager to assert his claim over her. Thrust into society as the Emerald Heiress, Julia is the toast of London, a celebrated curiosity. But in reality she’s trapped between the clutches of two powerful men. Aided only by a gentleman whose intentions she prays she can trust, Julia must finally take control of her own fate—but outwitting one’s foe rarely goes according to plan. Jessica Dotta has continued strongly into her sophomore book, heaped with intrigue and mystery. Mark of Distinction has the feel of a Gothic novel by Charlotte Bronte and the high regency feel of Jane Austen, however Jessica Dotta's story telling has a smoother flow to it. Because let's face it, I never made it off of page 2 of Emma because of the dryness. 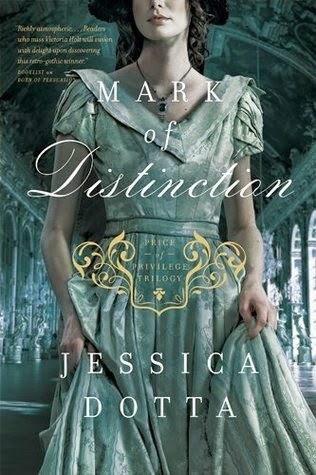 Mark of Distinction, like The Price of Privilege, the first book in the series, the pacing is similar to that of a Jane Austen movie, and that holds my attention. The attention to detail that Jessica applies to her stories is phenomenal. From the country home of Maplecroft to London House, the wealth of Lord Pierson is on full display. The lavishness of the aristocracy is on full view of Julia to experience in this installment. At the end of The Price of Privilege, we learn Julia is not who she thought she was. Instead of being the daughter of a despised atheist, she is actually the daughter of Lord Pierson, one of the leading men of London, from an affair. Julia has been thrown from one world into another. In this book, Julia observers a lot of things, but her input isn't widely aired. She is seen to by her father, Roy Pierson, and also by Lord Darly. A young man who was taken in by her father when Darley was young. Now, Lord Pierson is determined to see the two wed. However, Julia is worried over the recourse of her sudden nuptials with Mr. Macy and her love for Edward, but her father doesn't seem concerned over either of them. There were many things that had me thinking in this story. Mainly it was Forrester. The amount of dislike he showed toward Julia made me wonder what else was going on with him. I was surprised with his actions in the end and the pivotal role he played. Lord Pierson is also a confusing man. One moment he can be in a rage, next he is full of concern. It was hard to understand him at times. Darly, he is a gentleman to the highest form, attentive, caring, and smart. Edward, sadly isn't in this story a whole lot, but I'm interested to see what happens with his character in the third installment. And Mr. Macy, what is this man's game? What cards does he hold? Secrets were revealed in this story, but more questions were put in their place. Right when you think you have a handle on something, things change yet again. Since we only view the story through Julia's eyes, we only get to see what is brought to light around her. As far as Julia in this story, I actually enjoyed her more in book two. She seemed to have grown up with everything swirling around her. Her changes are subtle, but they are noticeable. She isn't as vocal in this story, as I noted earlier, but it is understandable with the the sudden changes in her life, and the unknown. I look forward to see what happens in book three. The ending Mark of Distinction had me a bit surprised. It was a quick ending, with many new revelations and acts. I'll leave it there so nothing will be spoiled. Jessica Dotta has always been fascinated by England during the Regency and Victorian era. Her passion for British Literature fueled her desire to write in a style that blends the humor of Jane Austen and the dark drama of a Bronte sister. She lives in the Nashville area with her family and works as a freelance media consultant and publicist. Thank you to the Tyndale Blog Network, I received a copy of this book for free in exchange for and honest review. It was a very intriguing book. Can't wait to hear what you think!